This enclosure designed by Tecton for brown bears is one of the most dramatic buildings in our zoo. The structure made full use of a deep ravine to create a dramatic landscape from which the bears could be viewed. The form allows visitors to view the animals from above, both from the expansive high level semi-circular terrace set against the hillside and from the lower boldly-cantilevered terrace, projecting out over the ravine like the prow of a ship. The design of the enclosure was originally much larger but had to be modified during construction when a large cavern was discovered in the limestone beneath the site. The cavern was retained as part of the varied terrain enjoyed by the bears. The unflinchingly geometric forms used for the viewing terraces contrast sharply with the rugged, natural background of the hillside, into which the indoor animal houses are built. The building shares common features with the other Tecton buildings within the zoo. The standard parapet and railing – a low wall with its coping raised on elliptical-section steel struts – gives adults a raised surface on which to lean, and allows children to view the animals without being lifted up. The upper terrace behind this parapet is supported at 20-foot intervals on centrally-placed columns with mushroom capitals. 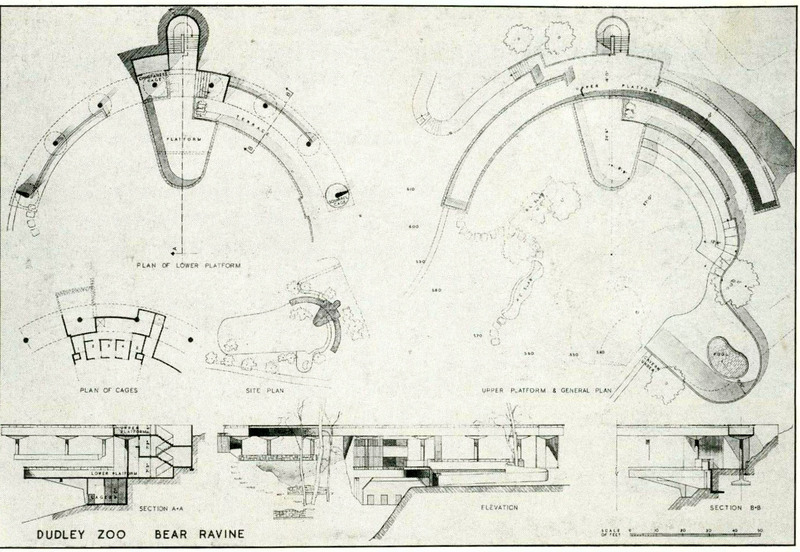 This feature was also used for the polar bear, lion and tiger complex, providing a visual link between the buildings, despite their very different forms. The westernmost column was originally enclosed by wire mesh, creating a circular enclosure to house squirrels. The enclosure does not meet modern animal welfare standards, and has therefore not housed bears for many years. In 2013 a Heritage Lottery funded project restored 4 of the Tecton structures, The Station Cafe, Entrance, Bear Ravine and adjacent Kiosk. The project team sought to repair the dilapidated structures and restore their original design intent. The restoration works were completed in 2014/2015. More information on the project can be found on the website link below.